With winter on its way to Regina and Moose Jaw, it’s time to starting thinking about adding winter tires to your vehicle so you can remain safely in control when the days get colder and snowier. We’ve noticed that drivers who schedule service with us often wonder whether they need specialized winter tires instead of all-season options. It’s important to understand the difference — keep reading for a quick and easy guide. All-weather tires have been designed to handle well on wet roads or those covered in slush and snow while also working fine in less treacherous situations. However, winter tires are made specifically to work in snow and ice, with a tread design that meets those demands completely. In fact, they can provide up to 50 percent more traction over all-weather tires. Additionally, all-season tires will become harder and less pliant at 7º C and below, while winter tires use rubber compounds that stay flexible as the temperature drops. Drivers around Regina and Moose Jaw will typically see plenty of snow and experience temperatures below 7º C for extended periods, so it’s highly recommended that they switch to winter tires. Just make sure you fit them on all four wheels instead of just two, as differing rubber compounds and treads can impair acceleration, braking, handling, and control. At Crestview Chrysler, we maintain an extensive inventory of all types of tires, including winter options for a wide range of vehicles. Just use our handy online tool to enter your vehicle’s year, make, model, and wheel size, and we’ll find the tires you’re looking for. Once you’ve selected the tires themselves, you can either come in to pick them up yourself or have our skilled auto technicians install them for you. Remember to keep checking our rotating service specials for the opportunity to save yourself some money when you make the change. 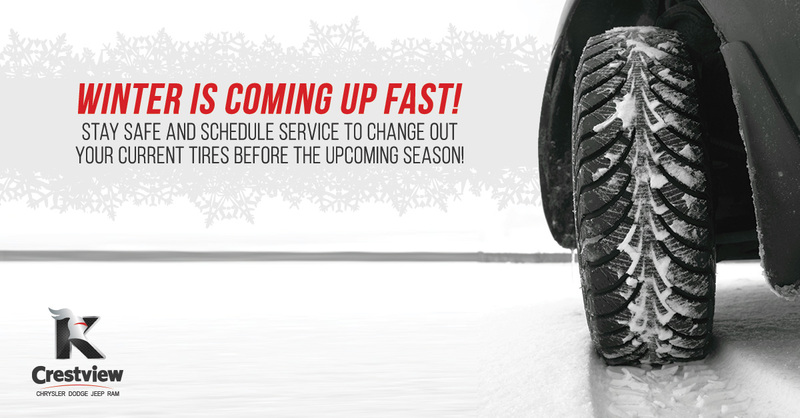 For more information, or to order a set of winter tires, contact Crestview Chrysler today. We’re happy to provide the service, tires, and accessories to help you tackle the winter months safely, and we hope to see you soon.